For many homeowners, one of the best features of their landscape design are their outdoor lights. From garden post lamps to decorative lanterns, little faerie lights to automated pool lights, these fixtures can make any landscape look warm and inviting. However, some people often choose not to install outdoor lighting in the interest of cutting landscaping costs or simply not seeing the appeal. What they don’t realize is that landscape lighting can do more than just highlight your yard’s best features. In fact, here are five great reasons why outdoor lighting is highly beneficial. Your outdoor living space should be designed to optimize your comfort and enjoyment. If you treat it like an afterthought, you won’t get much value. Once you’ve invested in a patio, outdoor kitchen, or barbecue island, you’ve created the perfect place to entertain guests, bond with your family, or just enjoy some fresh air in a safe environment. Don’t let lack of proper lighting ruin the experience! By including outdoor lights in your landscape design, you can play around with the illumination—and, consequently, the mood and ambiance—of your outdoor living area. Dim the lights if you’re enjoying a quiet, romantic evening with your partner or bring it all the way up to make your outdoor parties more festive. Installing outdoor lights is just as much about safety as it is about aesthetics. It doesn’t matter how well you memorize the layout of your backyard or how smooth your walkways are. If you’re navigating your landscape at night, you need to be able to see every step you’re about to take. Relying on street lights—or just the light from your neighbor’s house—to guide you as you stumble about your yard really isn’t the best idea. 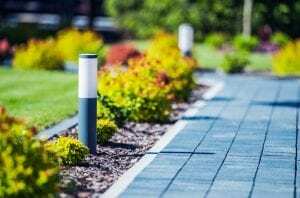 Placing lamp posts or path lights along your walkways is a much more practical—and safer!—solution. There’s a reason thieves and squatters usually pull off their heists at night. Doing legally questionable acts in broad daylight is sure to cause a commotion. Likewise, attempting mischief in illuminated areas is equally ill-advised. Therefore, if your backyard is a bright, well-lit area, any intruders or prowlers wandering near your property will be discouraged from taking a shot. After all, the brighter the lights, the higher the likelihood that other people in the neighborhood will see them (and act accordingly). A lot of people invest in home renovation and landscape design in order to improve the market value of their property. Generally speaking, additions and upgrades will increase your property value (depending on a number of factors). Outdoor lighting, being a technical addition, is actually considered an essential home feature by roughly half of new homeowners looking to buy. In fact, as many as 49% of potential buyers consider it a “desirable quality” when home shopping. By installing outdoor lights in a way that visually complements your overall property, you greatly improve your curb appeal and—potentially—your property’s market value. If you’ve invested in a handful of unique statement pieces for your yard, you definitely want to draw attention to these intended highlights. However, if your outdoor area is cluttered with other noteworthy décor, visitors’ attention could end up divided. Outdoor lighting is a good way to spotlight areas that you want people to focus on, whether it be your pool, your Japanese garden, a quaint garden cabin, or hedge labyrinth. Adding strategically placed lights leading to or surrounding your features of interest is a very artistic—and very effective—way of drawing all eyes towards it. Outdoor lighting in landscape design is not to be underestimated. Installing the right kind of outdoor lights for your specific layout can prove to be useful, practical, and generally stunning to look at. At a loss as to what to include in your backyard landscape design? Here are 7 must-have elements! ← Do Landscaping Contractors Near Me Need a License?